Let’s explore cylinders and their volumes. Here is a circle. Points $A$, $B$, $C$, and $D$ are drawn, as well as Segments $AD$ and $BC$. What is the area of the circle, in square units? Select all that apply. If the area of a circle is $49\pi$ square units, what is its radius? Explain your reasoning. What is the volume of each figure, in cubic units? Even if you aren’t sure, make a reasonable guess. Figure A: A rectangular prism whose base has an area of 16 square units and whose height is 3 units. Figure B: A cylinder whose base has an area of 16$\pi$ square units and whose height is 1 unit. 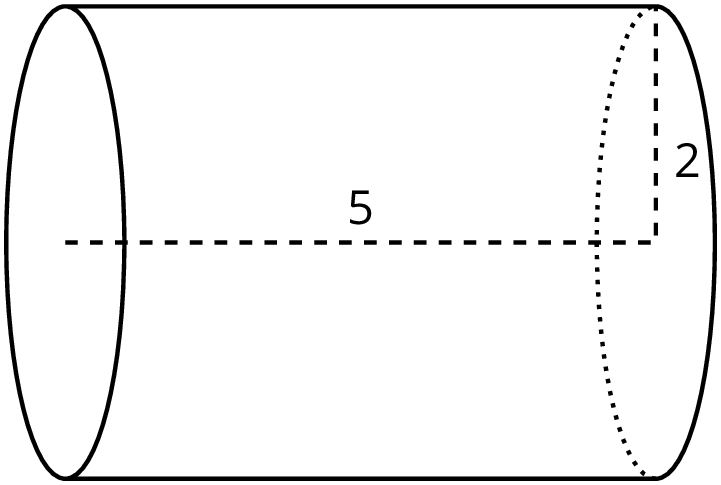 Figure C: A cylinder whose base has an area of 16$\pi$ square units and whose height is 3 units. Here are solids that are related by a common measurement. In each of these solids, the distance from the center of the base to the furthest edge of the base is 1 unit, and the height of the solid is 5 units. Use 3.14 as an approximation for $\pi$ to solve these problems. Find the area of the square base and the circular base. Use these areas to compute the volumes of the rectangular prism and the cylinder. How do they compare? Without doing any calculations, list the figures from smallest to largest by volume. Use the images and your knowledge of polygons to explain your reasoning. The area of the hexagon is approximately 2.6 square units, and the area of the octagon is approximately 2.83 square units. Use these areas to compute the volumes of the prisms with the hexagon and octagon bases. How does this match your explanation to the previous question? For cylinders A–D, sketch a radius and the height. Label the radius with an $r$ and the height with an $h$. Earlier you learned how to sketch a cylinder. Sketch cylinders for E and F and label each one’s radius and height. Here is a cylinder with height 4 units and diameter 10 units. What is the area of the cylinder’s base? Express your answer in terms of $\pi$. What is the volume of this cylinder? Express your answer in terms of $\pi$. A silo is a cylindrical container that is used on farms to hold large amounts of goods, such as grain. On a particular farm, a silo has a height of 18 feet and diameter of 6 feet. 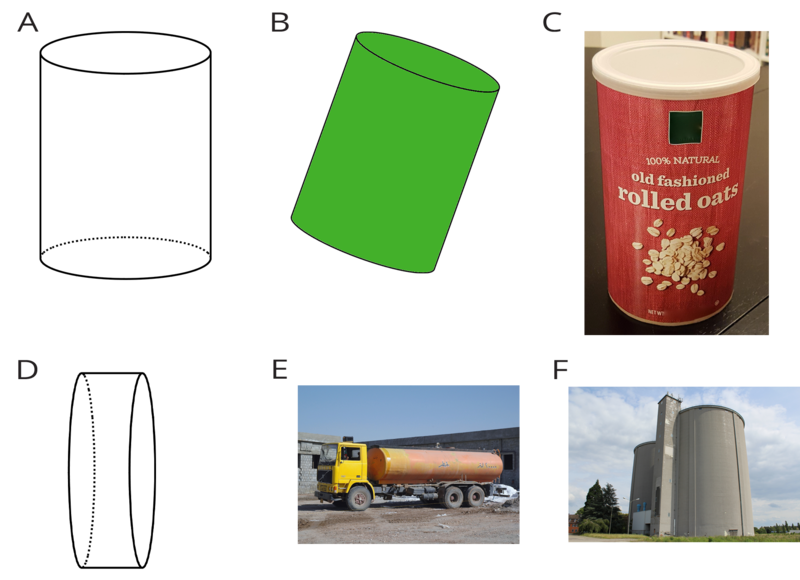 Make a sketch of this silo and label its height and radius. How many cubic feet of grain can this silo hold? Use 3.14 as an approximation for $\pi$. One way to construct a cylinder is to take a rectangle (for example, a piece of paper), curl two opposite edges together, and glue them in place. Which would give the cylinder with the greater volume: Gluing the two dashed edges together, or gluing the two solid edges together? 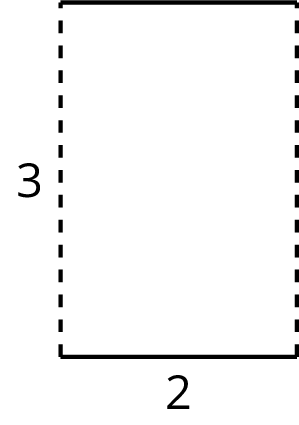 The volume of a rectangular prism is a result of multiplying the area of its base by its height. The base of the cylinder is a circle with radius $r$, so the base area is $\pi r^2$. Remember that $\pi$ is the number we get when we divide the circumference of any circle by its diameter. The value of $\pi$ is approximately 3.14. Just like a rectangular prism, the volume of a cylinder is the area of the base times the height. For example, take a cylinder whose radius is 2 cm and whose height is 5 cm. The base has an area of $4\pi$ cm2 (since $\pi\boldcdot 2^2=4\pi$), so the volume is $20\pi$ cm3 (since $4\pi \boldcdot 5 = 20\pi$). Using 3.14 as an approximation for $\pi$, we can say that the volume of the cylinder is approximately 62.8 cm3.